My Vehicle Page/Bio – Email custom webpage with selected vehicles/detailed vehicle info; allows customers to start credit app and trade-in from home. IntellaCar Transact – Allows customers to price/purchase vehicles on website or iPad; includes credit app and trade-in features. 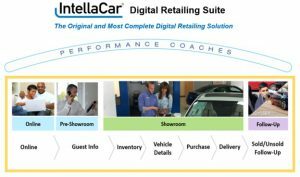 IntellaCar is the complete digital retailing system that helps you increase sales, boost productivity/efficiency and generate a higher F&I take rate. Call today to for a demo or to find out more.